Aloha Exchange Club President Winston Churchill, left, presents an ‘Officer of the Month’ award to Officer Dominic Uyetake. 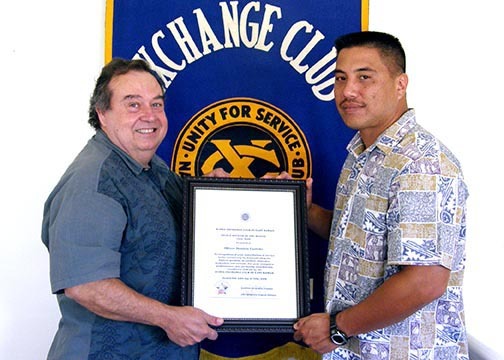 The Aloha Exchange Club of East Hawaii recognized Vice Officer Dominic Uyetake on Thursday (July 24) as “Officer of the Month” for June. Uyetake, who is a member of the Ice Task Force, was honored for his efforts that led to arrests and the recovery of methamphetamine from a house in Orchidland Estates. The house had been the subject of neighborhood complaints about heavy vehicular traffic and suspected drug dealing. Uyetake’s investigation over several months resulted in a search warrant that officers executed on June 4. They found 113 grams of methamphetamine and $2,600 in cash, which was seized for forfeiture. Five people were arrested at the house. Police charged one with first-degree meth trafficking. A week later an additional suspect was found, arrested and charged with meth trafficking. Both men were also charged with other drug offenses. In nominating Uyetake, Lieutenant Samuel Jelsma said it was the officer’s “diligence and continued efforts” that both resolved a public complaint about a drug house and led to a sizeable recovery of methamphetamines.